British Prime Minister David Cameron and Iranian President Hassan Rouhani have expressed hope that a framework on the Iran nuclear deal can be agreed within the next few days. "Both leaders reaffirmed their commitment to securing a deal," a spokeswoman for Cameron said on Thursday. "They both agreed that the ongoing discussions in Switzerland and the possibility of securing a political framework by the end of the month presented a historic opportunity," she added. Britain’s PM also told Rouhani that Iran needed to acknowledge the international community’s concerns about whether its nuclear program was being developed for peaceful purposes. Despite international criticism, the Iranian government has repeatedly brushed off allegations it wishes to acquire nuclear weapons. Iran, Germany, France, the UK, Russia and China are due to meet in Lausanne on Saturday to try to overcome an impasse in the nuclear talks. They are hoping to hammer out a deal before the looming deadline of March 31. "The Iranians needed to take on board that the E3+3 [Germany, France, the UK and three non-EU nations US, Russia and China] would need to allay those concerns through any deal," PM David Cameron’s spokeswomen said. "We are clearly approaching this (with the idea) that it is possible to do a deal, we believe, with Iran that will ensure we stop Iran from acquiring a nuclear weapon." “After many years of faltering negotiations it does indeed appear that progress is being made,” she said. Hudson expressed hope that a deal could deepen peaceful international ties, and help establish a so-called Weapons of Mass Destruction Free Zone in the Middle East. “In a region of such volatility, where states already possess chemical and nuclear arsenals, the creation of such a zone would be a huge boost to state relations - and could prevent a damaging downward spiral of nuclear proliferation,” she said. On his official English twitter account, Rouhani said the lifting of international sanctions on Iran was the most important step in reaching a deal. 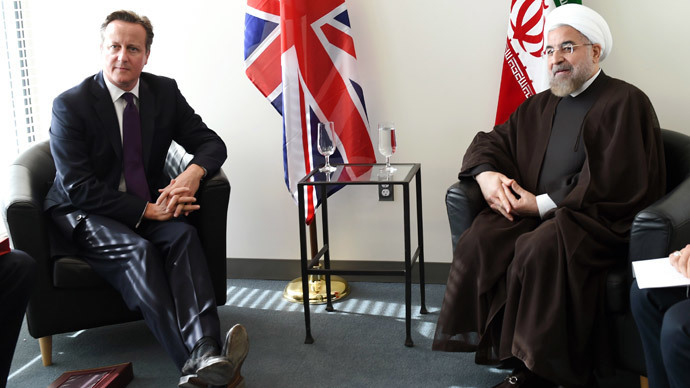 Rouhani and Cameron also discussed the conflict in Yemen and the possibility of reopening the British embassy in Teheran. Cameron told Rouhani that a political process is needed to restore stability in Yemen, and to achieve this President Hadi should be supported as the legitimate leader of Yemen. “The Prime Minister emphasized that there needs to be a political process to restore stability and, as part of that, other countries should not be supporting the Houthi rebels but rather encouraging all the different parties in Yemen to come together in a political process,” Cameron’s spokesperson said. As over a decade of tense Iran nuclear talks come to a close, Saudi Arabia has launched airstrikes on Houthi militants in cooperation with Egypt and Gulf neighbors Qatar, the United Arab Emirates, Bahrain and Kuwait. Britain’s government said Thursday that it supported Saudi Arabia’s intervention but was not contributing to the effort. Iran has condemned Saudi Arabia’s military intervention, with Iran’s Foreign Minister Javad Zariftold warning the military action will escalate tension in the region. The Houthis are thought to receive support from Iran, while Yemen’s President Abed Rabbo Mansour Hadi has the support of Saudi Arabia and the US.